A group of young professionals from Bua in Fiji are worried about provisions in the new constitution which affect the rights of indigenous landowners. The Bua Urban Youth Network have written to the Chairman of the iTaukei Affairs Board expressing dismay that the new constitution appears to give the government more of a say in development matters than landowners. A spokesperson for the group, Vani Catanasiga, tells Bruce Hill the issue of land rights is a very sensitive one for all Fijians. CATANASIGA: Our network started in 2007, we’re just a group of young professionals that work in Suva, but are originally from the province in Bua. And if you know about Bua, basically there’s a mining boom in our province right now and we’re concerned about that, because we have relatives that live in the villages and reported that to us about what’s happening and because we kept hearing stories about this. We did do a base line survey where the mine site is at right now in 2012 and basically we just started working from there. So our network evolved from a social network into something more meaningful, trying to do work to get our people in the villages to understand the impacts of mining, yeah. HILL: Well, these sections in the Constitution 27 to 30, talk about land rights, royalties and the Fijian peoples rights to control their own land. What is it in these parts of the new Constitution that you have problems with? CATANASIGA: We’ve heard about the promise of royalty, that’s going to be paid out to people, if they’re land is being mined, they get to share in the royalties and they also. I mean for us, the Constitution, when they first announced it, it was a bit of sort of we were curious, because the issues that we had concerns about were seemingly being dealt with effectively in this Constitution. But we’ve had a read of it and from our understanding, we’ve decided it’s of concern, because even though it promises the ability for customary landowners to have, it protects their right and interest. I mean if you read further into the document, it’s concerning, because one, the issue of land bank. We’ve had some experiences of the land bank in our province, not so good, and what it basically says is that it’s prioritised, for us we read it as state in these sections of the Constitution, it’s prioritising the economic interests, rather than our ability to decide how we use that land. HILL: I suppose in every Pacific country though, the governments have to make a trade off between the rights of landowners and the country’s need for economic development? CATANASIGA: Well, I think for us it’s because, for us it’s easy, we see that more as the easy option, that this is an easier option to take. But in reality, for the long run, it costs more to people to give up something like land for mining, because in the end future generations will have to pay twice as much or even more for the loss of their livelihoods, their ability to practice their culture, things like this we have to take into consideration and not just short term economic benefits. For us, it’s more the issue of, OK if you’re interested in developing, but developing meaning fully for the long term, then we have to be able to research what kind of developments are effective, but also protects the interest of future generations. HILL: So what would the Bua Urban Youth Network want the government to change about these elements in the Constitution, what kind of changes are you looking for? CATANASIGA: Well, when we had done our Constitution submissions last year when government was accepting submissions. What we particularly asked for was to build into the Constitution, a clause that allows, that makes it mandatory that free prior informed consent of landowners are sought before they’re natural resources are used for development programs and that’s not something that appears in this Constitution and something that we’re really concerned about, which is why we’ve written to the Chairman of the iTaukei Affairs Board. An NGO activist in the country has called for a total ban on the Deep Sea Tailing Placement system by mining companies operating in Papua New Guinea. Theresa Kas, Coordinator of The Nature Conservancy, an NGO that works closely with the local people in protecting their environment, said this last week in Madang whilst expressing her views on the use of the Deep Sea Tailing Placement system used by certain mining companies operating in the country, including Madang- based Ramu Nickel mine, Lihir, Simberi and Misima. Kas described the DSTP which Ramu Nickel Mine is using to dispose its mine wastes into the Basamuk Bay, as ‘a long term death sentence’ for the people of Madang Province and Papua New Guinea as a whole. She said the government has imposed a long term death sentence on its own people by allowing through the law mining companies to dump their wastes into our ocean and river systems. Kas went on to say that the laws of Papua New Guinea are contradicting themselves, in that whilst there are bylaws protecting the environment, there are also provisions that allow for destructions. 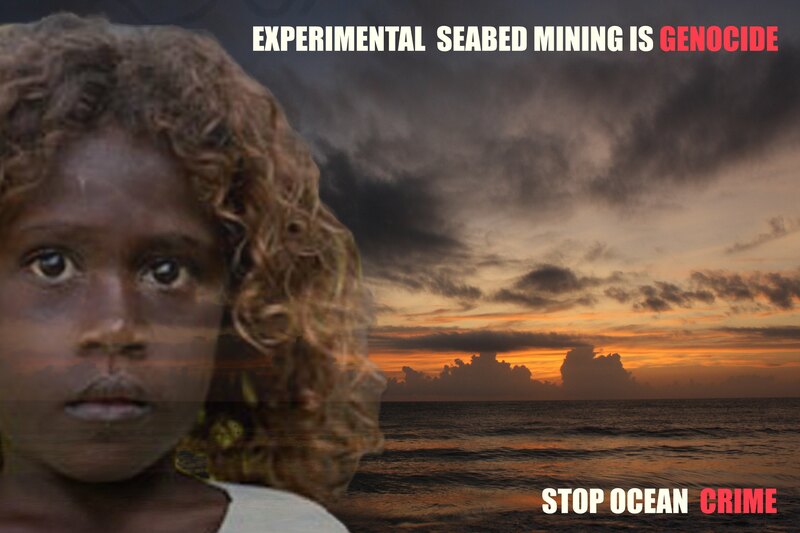 She further elaborated that the tide in the Bismarck Sea is very strong and can carry poison as far as New Ireland and even the Solomon Islands, and therefore DSTP must be stopped and should never be allowed in any mine at all in the country. Meanwhile, the PNG Constitutional and Law Reform Commission has called on stakeholders in the Islands region to participate in the review of environmental and mining laws relating to management and disposal of tailings or mining waste. A team from the CLRC made this call in Kokopo, East New Britain on Wednesday. It is understood CLRC was now consulting with relevant stakeholders, including the department of environment and conservation, mining, petroleum and energy, the chamber of mines and other industry groups. CLRC on Wednesday urged people and stakeholders in NGI region to state their views on the current state of waste management and disposal of tailings and make proposals for change. The call was made especially to those stakeholders with various concerns living in the mine tailings disposal areas, including water-ways and coastal areas over mining waste management and disposal into the environment and the consequential harm to the environment. It is understood that there has been recent concerns and reports on the high toxicity levels of hazardous chemicals and heavy metal traces which have been found to occur in the sample of population in mining waste disposal areas throughout the country and the Great Barrier Reef in Australia. CLRC also highlighted in Kokopo that there was a need to systemically and properly consider the concerns raised by indigenous citizens and consider corrective measures. While mining is one of the most important economic sectors in PNG, it also causes negative impacts on the environment. NAUTILUS Minerals has warned people to be wary of persons going to villages claiming to represent the company and issuing statements. Nautilus Minerals country manager Mel Togolo issued the warning while denying claims posted on social media that said the company was trying to evict New Ireland villagers from their homes. According to the Radio Australia Pacific Beat programme, locals from Danu village said they were approached at night by a Nautilus representative and forced to sign papers agreeing to relocation. Togolo said the eviction claims for west coast New Irelanders to make way for onshore facilities were completely false. “One of the main advantages of a sea-based project compared with many land-based projects is that no people need to be moved and there will be no tailings,” Togolo said in a statement. He also denied the company had any links with Benson Tomarum. “Benson Tomarum does not work for Nautilus Minerals nor is he affiliated with the company in any form,” Togolo said. “The communities of New Ireland should be aware that the statements attributed to Tomarum in the social media are not authorised by the company and are untrue and unfounded. “We urge our community members, and the social media to act appropriately and responsibly. The Danu villagers had voiced their fears in a video posted online, where they outlined their concerns of losing access to their fishing grounds and fresh water as well as schools and health services. Several men detailed how they were approached and forced to sign documents. THE Constitutional and Law Reform Commission has called on stakeholders in the Islands region to participate in the review of environmental and mining laws relating to management and disposal of tailings or mining waste. The head of the company that owns the gold mine in Solomon Islands says there is little more it can do to stop illegal mining. Tim Lehany says up to 200 people – including children – unlawfully extract gold from the Gold Ridge pits every night and a small amount of illegal mining also occurs during the day. Transparency Solomon Islands has expressed concern about the miners’ safety but Mr Lehany says the site’s terrain and issues of customary land ownership make it difficult to keep them away. He says the mining company security team is not there to get into physical confrontations. Tim Lehany says his company is very concerned that someone will get hurt and is working closely with the police.